Matsuzaka Castle (松坂城) one of the 100 best Japanese castle located in Matsuzaka, Mie Prefecture. It is a hilltop castle constructed in 1588 by Gamo Ujisato. This castle has one of the most beautiful and strong stone walls to create each belly. That top of the Tenshu-kaku tower's basement is 38m high from the sea level and has a great view of all Matsuzaka era. All buildings are lost, but those stone walls, bellies are remaining in the great condition and you can study one of the best structures of Samurai castles in Japan. Matsuzaka castle is also registered as the national historic sites as well. Matsuzaka Castle is a hilltop castle located in Matsuzaka, Mie Prefecture. In 1588, Gamo Ujisato, one of the Toyotomi Hideyoshi's Samurai, moved this place and built this castle and its castle town. The stone walls of this castle are considered as one of the best ones in Japan. 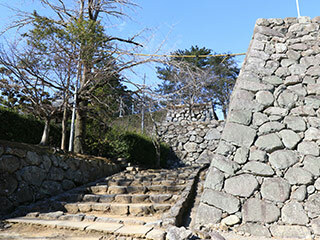 It is the same style as Azuchi castle that uses various kinds of stones put them together without reshaping it. It is called Nozurazumi. From the ruins of the basement of each watchtower, it has a great view of Matsuzaka ear.